This year promises to be another fantastic 12 months in the Skegness darts calendar - with plenty of events coming up. A World Champion night at the Liberal Club will be held on January 22, with nine-time world champ Trina Gulliver (pictured) and two-time current world champ Lisa Ashton taking on a number of local players. They will also go head to head if time allows. April 23 will see a Curry with Kong night as Robbie Green is appearing at the Lumley Bar-Restaurant, again taking on a number of oche aces from the patch. The man nicknamed Kong will also be back in the town later in the year. Tickets for this extravaganza cost £10, including the all-you-can-eat curry. The Skegness Darts League’s presentation night will be on June 3, with world number one and Lakeside hot favourite Glen Durrant in attendance at the Working Men’s Club. It is also hoped that 2013 world champ Scott Waites can also make it to the town for a number of events during the summer, with venues currently being sought. After the huge success of last year’s pro-am tournament, the Skegness Ex Servicemen’s Club have agreed to stage the event again this year. The qualifiers will start in February and all dates will be finalised in the next two weeks, along with the player line-up. The year’s final event will be the Skegness Masters on November 6. The day-long event will see eight players taking part in the inaugural event, featuring pros playing in an invitational knockout in the afternoon, before the pro-am itself at night. Entry into the qualifiers has again been set at £2 and will feature a mix of best-of-three knockout and last-man-standing competitions. 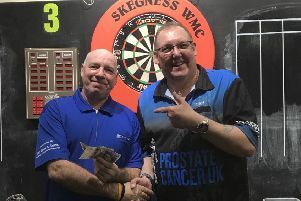 Anyone wishing to sponsor a player in the pro-am, or if any pub, club or organisation would like to put on a darts event, they are asked to contact Chris Fletcher on 07789 405 588 or email skegowl@hotmail.com.